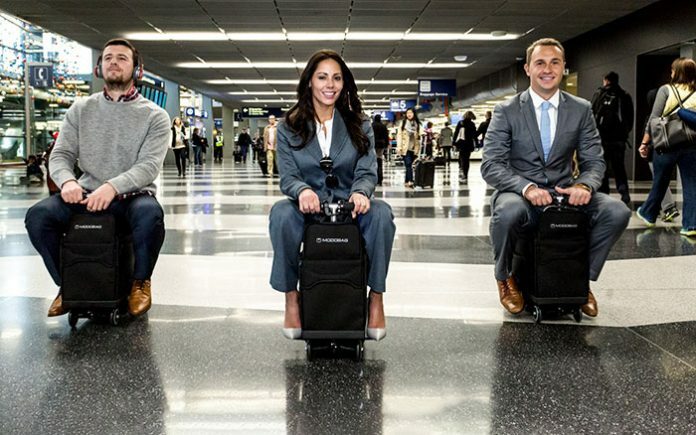 Modobag is the world's first smart, motorized, rideable luggage - a carry-on that carries you! The next time you travel, instead of lugging around your heavy suitcase, let your luggage do the work of carrying you around. The Modobag is a revolutionary piece of motorized carry-on luggage that allows you to ride it and makes traveling fun. With 1800 cubic inches of interior stowing capacity, the Modobag can accommodate riders up to 260 lbs. The bag can travel up to 6+ miles on a single charge (based on a rider weight of 180lbs). It is lightweight, and can easily convert from motor to pull-behind use. It comes with dual USB charging ports for your electronics and optional GPRS-GSM tracking. The company claims that their Lithium batteries are compliant with the air travel regulations for the UN, TSA, FAA and IATA and use the latest patented nano-crystal technology. The Modobag aims to change the way the world travels. As of this writing, the bag is available on the company’s website for $1,495. If you miss your next flight, there’s no need to worry: Modobag will keep you occupied in an airport terminal for hours.